Channelside Tampa is an entertainment complex located in Downtown Tampa. This neighborhood is one of the fastest growing areas of Tampa with high rise condominiums, shops, dining, and entertainment venues. There are plenty of bars & night clubs in Channelside many including outside patio bars and live music. Channelside restaurants offer a dining experience for everyone including outdoor dining & upscale restaurants for a more intimate experience. Not only will you find a variety of bars & restaurants, there are several specialty shops providing shopping in Channelside. Come see the large cargo ships and commercial cruises enter and leave Tampa's Port. Listen to live music, catch one of the numerous special events, or just relax in the courtyard. Include in your visit some time for the Florida Aquarium or a Tampa Bay Lightning game at the St Pete Times Forum. 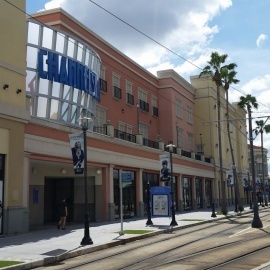 Channelside has trolley transportation from Downtown Tampa and Ybor City, as well as, valet parking, and a parking garage. You can also take a walk along the Tampa Riverwalk that spans all the way through Downtown. A new event that just started is First Friday which is a pub crawl celebration every first friday of the month. There are so many things to do that you may want to consider staying in one of the hotels near Channelside. We hope you have an open schedule this weekend, because Tampa's got a full itinerary of entertainment to get you off the couch and into the action.